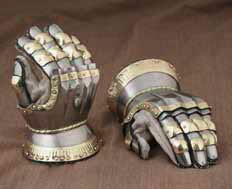 hese Churberg Hourglass Gauntlets are an ornate yet effective defender that adds an impressive look to your hands. Named, loosely, for their shape, as well as for a style that makes them a perfect match to our Churberg Armour (item number AH-6086), these gauntlets are equally appealing for reasons of defense and for reasons of style. They are crafted entirely from 18 gauge steel, which is heavy enough to provide some protection, as well as light enough to be comfortably worn as costume pieces and LARPing armor. The gauntlets possess a flared cuff and articulated fingers, and are heavily accented with touches of brass metal plating, giving them a two-toned coloration and a rich level of detailing that makes them look worthy of the highest orders of nobility. This page was last modified on 13 May 2014, at 13:13.